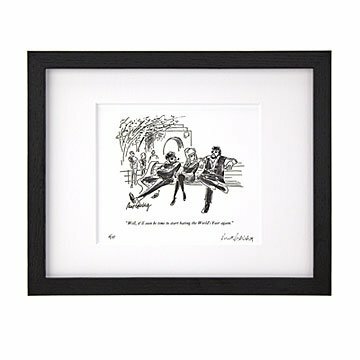 A limited edition print of the New Yorker cartoonists clever work, signed and numbered by him. "This was my first cartoon in The New Yorker," Mort Gerberg says about his 1965 illustration. "The Beatniks in Washington Square Park were the forerunners of protesters who didn't like that the World's Fair would be taking over Queens, and it was the beginning of the Civil Rights movement. So it seemed like a particular coming together of what was going on at the time." Known for his clever mix of wit and social commentary, Mort has been a working cartoonist for more than half a century. "World's Fair" is one in a series of limited edition prints we're offering (just 10 of each), numbered and signed by him with the same pen he uses to draw. Framed in solid ash wood with a double-thick mat, it's a gift for the person who enjoys art with a wink. Printed and framed in Oregon. $10 from your purchase goes to the New-York Historical Society, a premier cultural institution dedicated to preserving the richly layered history of New York and the US. If you're in Manhattan, please visit their exhibit of Mort's work, on display until May 5th.